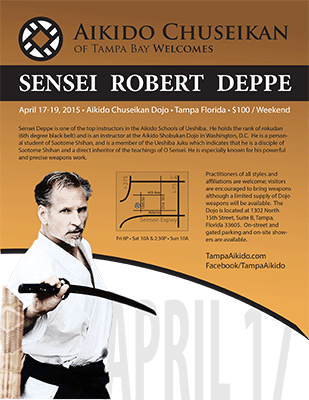 On April 17-19 (2015), please join us for a special seminar with Sensei Robert Deppe. Sensei Deppe is one of the top instructors in the Aikido Schools of Ueshiba. He holds the rank of rokudan (6th degree black belt) and is an instructor at the Aikido Shobukan Dojo in Washington, D.C. He is a personal student of Saotome Shihan, and is a member of the Ueshiba Juku which indicates that he is a disciple of Saotome Shihan and a direct inheritor of the teachings of O Sensei. He is especially known for his powerful and precise weapons work. Please download and share the flyer for additional details, and register early at our Facebook event page – attendance is limited!